You are here: Home / News / Free Manuel Duran Ortega Now! Manuel Duran Ortega is a well-known and respected journalist in Memphis, TN, who once helmed a TV station in El Salvador. After his life was threatened there more than a decade ago, he came to the US as an undocumented immigrant. 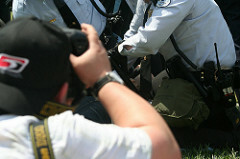 Duran was arrested by Memphis police April 3, while covering a local immigration rights protest, which took place during the commemoration of the 50th anniversary of the assassination of the Rev. Dr. Martin Luther King Jr. Despite wearing a press badge on a lanyard around his neck, police arrested him and charged him with disorderly conduct and obstruction of a highway or passageway. The Memphis police dropped the charges on April 5, and then turned him over to U.S. Immigration and Customs Enforcement (ICE), where he’s been held in an ICE detention center in Jena, LA, ever since. The Southern Poverty Law Center is representing Duran, who many believe has been targeted for his consistent coverage of police abuse and misconduct, immigration detention centers and coordination between Memphis police and ICE. NWU is proud to add our voice to the 26 press-freedom, civil-rights, labor and civil-liberties groups that submitted a letter on July 8, demanding the release of Manuel Duran Ortega. The Nashville Tennessean and The Memphis Commercial Appeal have also denounced his arrest and detention, which reflect both the war on immigrants as well as the war on press freedom being led by the White House. We call on ICE to release Manuel Duran Ortega immediately.